What are the common mistypes for pain? 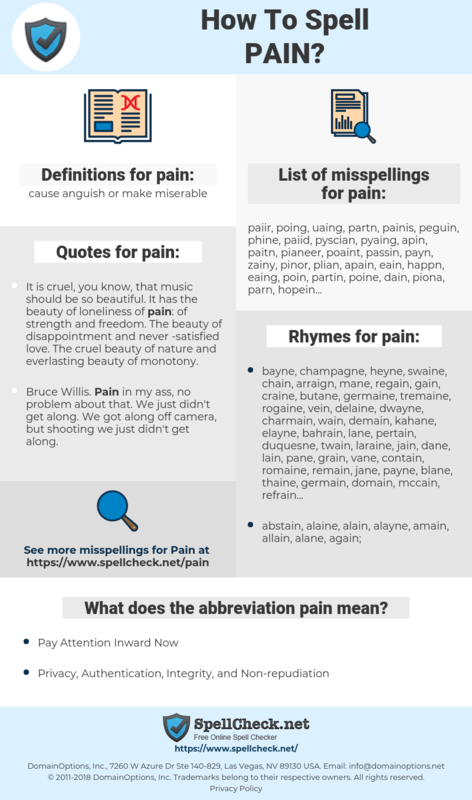 What does the abbreviation pain mean? What are the quotes for pain? What are the rhymes for pain? What are the translations for pain? What are the common typos for pain? Pain as a boy's name is a variant of Paine (Latin), and the meaning of Pain is "countryman, rustic villager, peasant". This graph shows how "pain" have occurred between 1800 and 2008 in a corpus of English books. It is cruel, you know, that music should be so beautiful. It has the beauty of loneliness of pain: of strength and freedom. The beauty of disappointment and never -satisfied love. The cruel beauty of nature and everlasting beauty of monotony. Last tour my bass rig was breaking down every other night. That was a pain. We would get on stage and Trey would count off the song, and I'd play the first note and nothing would be there. Those guys would just roll their eyes. leiden, Leid, schmerzen, Kummer, Schmerz, weh tun, Stich, Mal, Qual, Dolor. 疼痛, 痛, 苦痛, 辛さ, つらさ, くつう, とうつう. sufrimiento, molestia, pena, pesado, de dolor, congoja, dolores, del dolor.